They come to me after years of struggling with food. They’ve been on every diet, they’re likely binge eating – usually on sugar and carbs – , they feel stuck in a body they hate, and their confidence is way down. We work through lots of different things, and after a couple of months, they aren’t turning to food anymore. Their control of food stops. Food begins to find it’s natural place in their life. Now that they aren’t turning to food for excitement, for comfort, for love, or to avoid disappointment, or shame, they are faced with real life. When you remove the crutch (food), real life is exposed. And you’re forced to feel things and experience whatever comes your way. Happiness, sadness, loneliness, joy, uncertainty, discomfort in your body, inadequacy, boredom, heartbreak. And this can be really tough. Just a few years ago, I didn’t know how to handle these things without food. Food became so easy, and it was always there. So when I stopped turning to food, I was at a loss. I was faced with all this stuff that I didn’t know how to deal with. For that reason, I’ve designed my coaching program to focus heavily on helping these women learn how to move through life feeling and dealing with lots of different things without turning to food. We build up their “toolbox”. I teach them new ways to take care of themselves – not just their bodies, but also their hearts, their emotions, and their needs. You can handle it. Whatever comes your way, you’ve got this. Sometimes we’re so scared of heartbreak that we make ice cream our boyfriend instead. Or we’re so scared of feeling bored for a night, so we go to 7-Eleven to buy cookies to keep us company. Or we’re so afraid of dealing with the issues in our relationship, so we go on a diet to try to control some part of our lives and hope to feel better. It’s so easy to use food. But just remember….If you choose to feel it instead, you can handle it. What is this food doing for me right now? And then I want to dare you to feel it. Just this once. Sit on your couch and twiddle your thumbs because you’re so bored. Watch how ideas start to come to you. Cry your eyes out because you’re upset. Notice how alive it feels to actually cry. Feel the overwhelm. You’ll know what to do about it if you just sit with it. Embrace your feelings, and embrace real life. Don’t push it away. You can handle it. I promise. Think about how much more fulfilling life could be if we knew we could feel it all and handle it? In the comments below, share with me how this dare goes for you. When you felt your feelings instead of eating, just this once, how did it go? What happened? I’m here for ya! P.S. The most important relationship you have in your life is with yourself. 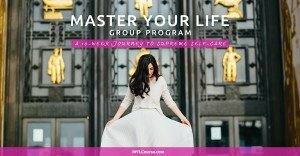 Check out the Master Your Life group coaching program to learn how supreme self-care can heal your relationship with food and give you rock solid confidence and strength. P.P.S. 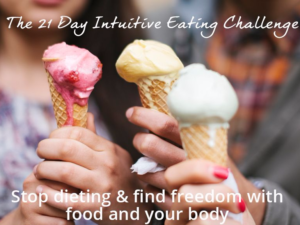 If you’re looking for support with emotional eating and/or your relationship with food…Thousands of women have gone through the Intuitive Eating Challenge and have completely transformed their relationship with food. Constantly thinking about food, obsessing over it, and stressing about it? This program is for you. You’ll learn how to get out of the diet mentality and move toward a free, easy, “normal” relationship with food. You can sign up anytime. Click here to learn more. Great post! Once I began my journey to being an Intuitive Eater, I was able to finally admit some of the feelings I use food to “fix”. Self-doubt, fear, and defeat are definitely the toughest feelings to actually let myself feel. This post is a great reminder that I CAN handle these feelings. Thank you!! Nice post! I LOVE the challenge of actually “feeling”. I have discovered how to do this through yoga. It is not unusual for me to cry while practicing. At first it made me judge myself, it even scared me, but now I try to observe my emotions and simply let them pass unthreateningly by. I try to see it as my body releasing something it needs to. It is a craft, that’s for sure! I’ve read this post about ten times already, just letting the words sink in and nodding in agreement of how true they are. It finally occurred to me just WHY I wanted to numb my pain: I feel like my life should always by happy and perfect and full of rainbows and sunshine. I don’t ever want to have a bad day. Who does, right? But life is full of bad days and I know there will be times in the future where bad things will happen to me – that’s life! Numbing the bad feelings or bad days with food does not help us cope with life’s hard times which in turn makes us fear those times even more! It’s like a lightbulb just when off in my head! 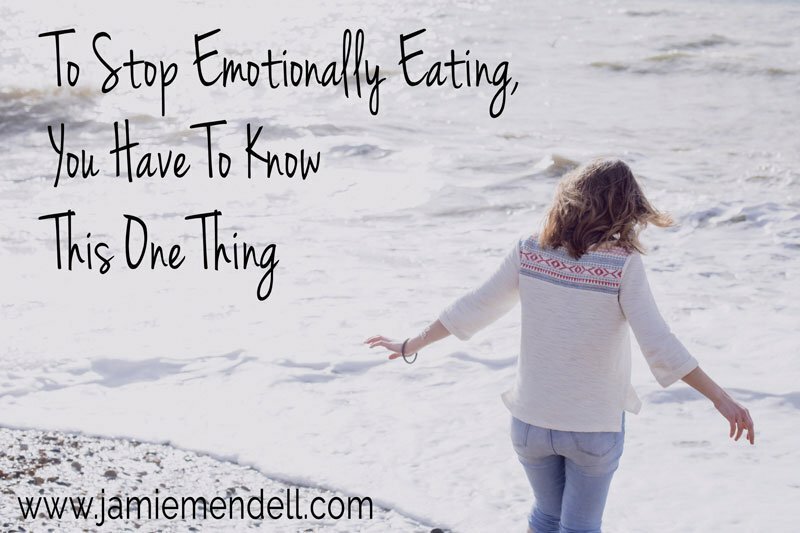 Emotional eating does us a disservice in so many ways! Best post ever. Beautiful writing and so very true.